"A South-West View of the City of New York in North America," printed by Bowles and Carver, engraved by J. Carwithaim, date unknown, Yale Center for British Art. This is entirely understandable. I shudder to think of my (as yet) unedited earlier entries in this blog that reflect my knowledge at the time! Museums and galleries include disclaimers like this one for instances just like this. The piece is undated in the Yale catalog entry, but the engraver is said to be active between 1720-1740. The image of the ship and boats do not contradict this, but there is one major flaw with placing this engraving so early in the century. While this clearly American flag works against the 1720-1740 date, it certainly cannot disprove it on its own. The American flag is hastily painted, and clearly added by a colorist, not by the engraver. The canton bears only eleven stars, and these are not carefully placed. The canton also overwhelms the space between the flag and the pole, coming off as haphazard at best. We could easily interpret this piece as one retouched later to reflect American independence. Still, it is worth digging a bit deeper when you come across red flags (so to speak). This is the most picturesque of all the larger views of New York which still exhibit the fort. The print is to be found both plain and colored. A companion picture by the same engraver, and issued by the same publisher, is entitled: "A Southeast View of the City of Boston in North America." Do we trust this source? A nineteenth century book transcribed on a blog that regularly posts about government mind control as laid out in Yahoo Groups and other kooky conspiracy theories? Crazy as this guy is, he does post a helpful direct link to the book on the much, much, much more reliable Internet Archive. 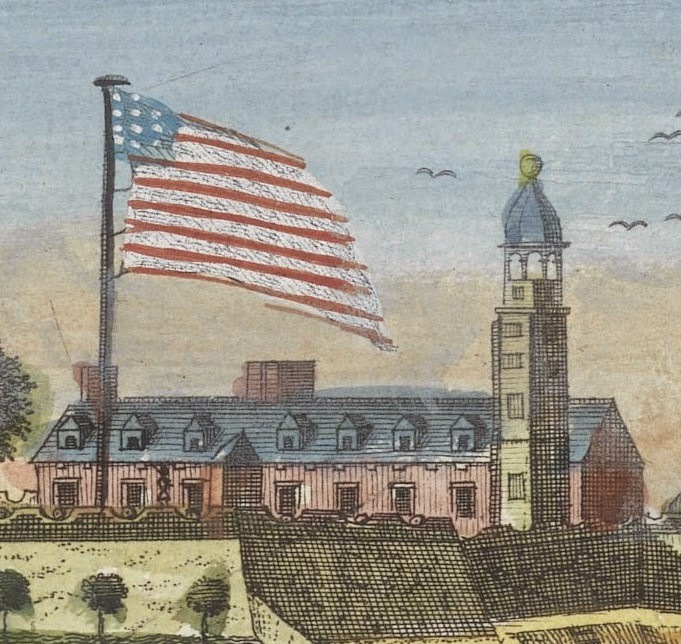 This proves his transcription is accurate, and the image is shown with a British flag over new York, not the American one added to the Yale British Art collection. Following the hint in the above book about the accompanying print of Boston, we find it in the Yale Center for British Art (also undated) and the Metropolitan Museum of Art. The Met gives us our first definitive date: 1736. 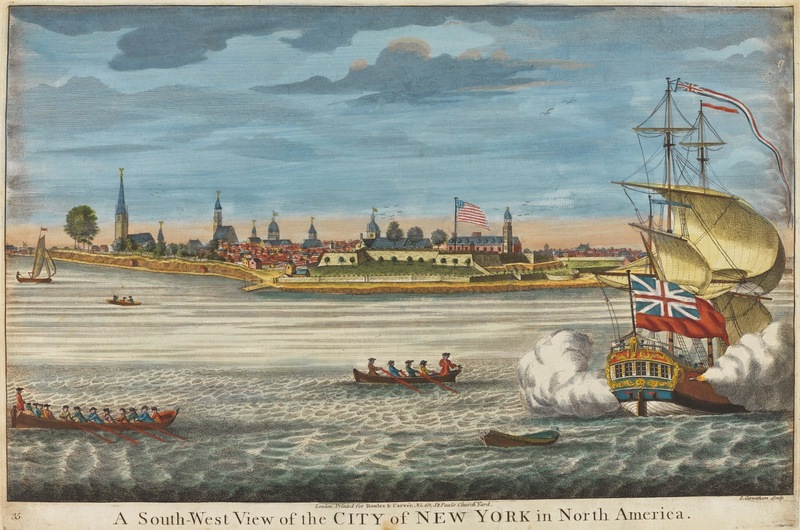 In the same collection we find another print of the South-East View of New York, dated to between 1725-1740. The conclusion is unsatisfying: the image itself was created too early for our study, and the specific print above was printed too late. What it does tell us is that the perception of sailors clothing had changed relatively little over time. Oarsmen dressed in colorful jackets and jockey caps in the first half of the century were close enough to those of the end of the century to be stand-ins.